To Cite: Luo P, HE X, Chen Q, Hong H, Yang L. Femoral Intertrochanteric Fracture With Spontaneous Lumbar Hernia: A Case Report, Trauma Mon. 2016 ; 21(5):e25132. doi: 10.5812/traumamon.25132. Introduction: The diagnosis of lumbar hernia can be easily missed, as it is a rare case to which most orthopedists are not exposed in their common clinical practice. Approximately 300 cases have been reported in the literature since it was first described by Barbette in 1672. Case Presentation: A 76-year-old woman who had been diagnosed with a femoral intertrochanteric fracture was sent to our department. Physical examination revealed a smooth, soft, and movable mass, with no tenderness, palpable on her left flank, which had gradually increased during the last seven years and presented with a slight feeling of swelling. We initially misdiagnosed the case as a left lipoma combined with the femoral intertrochanteric fracture. However, after six hours, the patient presented with a sudden onset of nausea, vomiting, and abdominal distension. Afterward, computed tomography (CT) examination confirmed that the mass was a spontaneous lumbar hernia. Conclusions: A lumbar hernia may, on rare occasions, become incarcerated or strangulated, with the consequent complication of mechanical bowel obstruction. We suggest that a patient with a flank mass should always raise suspicions of a lumbar hernia. Lumbar hernia is an uncommon condition caused by a defect of the posterior abdominal wall, with approximately 300 cases reported in the literature since it was initially described in 1672 by Barbette (1). According to Hafner et al., a general surgeon will generally have the opportunity to repair only one case of lumbar hernia in his or her lifetime (2). Several authors have reported that a lumbar hernia can develop after the harvesting of a bone graft from the posterior iliac crest (3, 4). To the best of our knowledge, only one case of spontaneous lumbar hernia has been reported in the orthopedic literature. Additionally, we found no document describing bilateral spontaneous lumbar hernia in association with femoral intertrochanteric fracture. 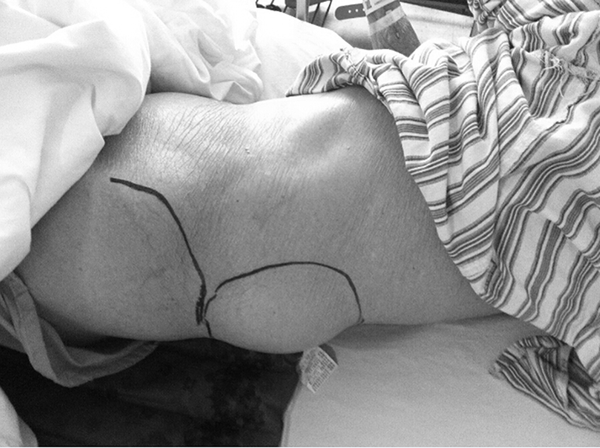 In August 2014, a 76-year-old woman with no previous surgeries or history of trauma was sent to our department with a suspected femoral intertrochanteric fracture after a fall. Physical examination showed, besides local tenderness and swelling of the right hip joint, a smooth, soft, and movable mass (about 12 cm × 8 cm), with no tenderness, palpable on her left flank, which had gradually increased in size during the last seven years and presented with a slight feeling of swelling (Figure 1). The right intertrochanteric femoral fracture (OTA classification 31A.3.1) was confirmed by X-ray radiographs. Routine laboratory tests were within normal range. Further examination of the left flank mass was not undertaken immediately, as we wrongly thought it was a lipoma. Six hours later, the patient presented with a sudden onset of nausea, vomiting and abdominal distension. Computed tomography (CT) examination of the abdomen revealed a bilateral lumbar hernia between the erector spinae muscle group and the internal oblique muscles through the aponeurosis of the transversalis muscle (Grynfeltt hernia) and bilateral ureteral expansion caused by distension of the bladder (Figure 2A-C). Manual reduction of the left lumbar hernia was performed successfully with an indwelling catheter, the waist was fixed with a belt, and the symptoms were relieved. Subsequently, a general surgeon was consulted and recommended surgical repair. However, the patient refused the operation to repair the bilateral lumbar hernia. An orthopedic operation to repair the bone fracture was carried out on the third day of admission, when the patient became medically stable, using intramedullary nail fixation after closed reduction of the right extremity, and the patient was discharged from the hospital five days later. This study was approved by the ethics committee of the second affiliated hospital of Wenzhou medical university, and informed consent was obtained from the patient. Figure 2. A, Computed tomography (CT) shows the filling of the bladder and intestine; B and C, axial CT shows the bilateral lumbar hernia. Orthopedic surgeons may not be familiar with lumbar hernias because of their low incidence. Lumbar hernias are usually classified as either congenital (10% - 20%) or acquired (80% - 90%) hernias. Acquired hernias are further divided into spontaneous and traumatic hernias depending on the causative factor (5). Lumbar hernias occur more frequently on the left side, are more common in men (2/3 of cases), and are most common in patients aged 50 - 70 years (6). Lumbar hernias protrude through two weak areas in the posterolateral abdominal wall the superior and inferior lumbar triangles, known as the triangles of Grynfeltt and Petit, respectively (6). The superior triangle is an inverted triangle, larger than the inferior lumbar space and probably the more common site for spontaneous hernias, which is bounded superiorly by the 12th rib, anteriorly by the internal oblique muscle, and posteriorly by the erector spinae muscles (7). The symptomatology of a lumbar hernia depends on its size and content and whether strangulation is present (8). Small hernias are usually asymptomatic but may cause lower back or flank pain with or without a palpable mass. Indeed, only 9 percent of cases present with signs and symptoms of acute bowel obstruction, including nausea, vomiting, abdominal distension, and abdominal pain (7). In the case described here, the symptoms were abdominal distension with nausea and vomiting, which suggested mechanical bowel obstruction. Inasmuch as the patients had undergone no abdominal operation, and taking into account the mass we palpated on the left flank of her body, an incarcerated hernia should have been initially considered. The diagnosis of lumbar hernia can be easily confused with other conditions, as it is one of the rare cases to which a majority of orthopedists are not exposed in their everyday clinical practice. Thus, differential diagnoses should be considered, including lipoma, hematoma, abscess, malignant or benign tumor, and rhabdomyoma, which may be difficult to distinguish clinically (9). CT analysis must be regarded as a routine investigative technique for patients with lumbar hernias, because of the sensitivity of CT in outlining the layers of the muscles of the posterior abdominal wall and its effectiveness in identifying the defect even in the absence of herniated abdominal contents (10). Most general surgeons think that lumbar hernias should be repaired in all patients unless they present with severe co-morbidities, because these hernias grow steadily in size and become more and more symptomatic. As surgical intervention becomes more difficult in advanced cases, operation should be recommended as soon as the diagnosis is definite (7). In this case, after we explained the risk of incarceration or strangulation of the hernia contents to the patient, who believed that the lumbar hernia did not have a significant impact on her daily life, she refused to have it surgically repaired. Nevertheless, we successfully used a conservative method to treat the incarceration of the lumbar hernia in this case. Although a rare occurrence, a lumbar hernia may become incarcerated or strangulated with the consequent complication of mechanical bowel obstruction. Thus, the diagnosis of incarcerated lumbar hernia should be kept in mind in patients with mechanical bowel obstruction, especially those with no history of previous abdominal operation and with a palpable mass in the flank area. Financial Disclosure: No funds were received in support of this work. No benefits in any form have been or will be received from a commercial party related directly or indirectly to the subject of this manuscript.